If you are looking to improve your soccer skills, nothing will help your game better than a soccer ball launching machine and the First Pitch Playmaker Soccer Ball Machine may very well be the best made, lowest priced soccer machine on the market. Whether you need to work on heading the ball, trapping it, one-time shots and passes or are a goalie who needs more practice blocking hard hit or curved shots, the First Pitch Playmaker will be invaluable to you. Unlike teammates or coaches who can never put the ball in the same place every time, the First Pitch Playmaker Soccer Machine is super accurate; it can repeat the same kick time after time, allowing you to get sustained and repetitive practice to work on each soccer skill. Adjustable speed dials for each wheel allow you to work on handling short passes or long kicks from left or right footed kickers, with or without a curve on them and the easy to adjust angle knobs allow you to shoot balls low or high. Work on handling cross field kicks, chest traps, volleys, headers into the goal or catching up to long goalie kicks. Goalies can practice catching or blocking shots that travel up to 100 MPH! 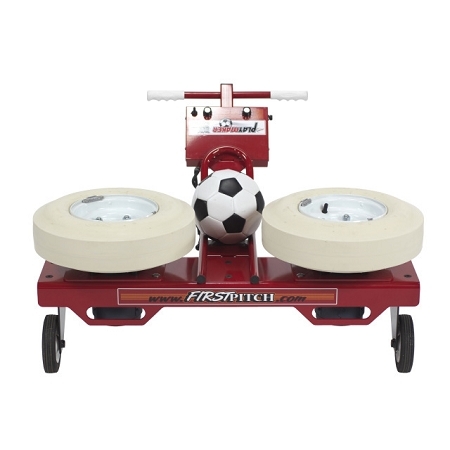 Unlike many other pitching machines, there is no need to order a separate set of transport wheels for the First Pitch Playmaker; it comes with the wheels already attached, making it super easy to get it onto the soccer pitch or move it around the field. Made entirely in the USA, featuring an industry-best 5 Year Warranty and a 14 day Satisfaction Guarantee, you know you will get many years out of this soccer ball machine. Like all machines on this website, the First Pitch Playmaker ships free. This soccer machine is powered by any standard 110 volt electrical outlet. Order your Discount First Pitch Playmaker Soccer Ball Machine today, while it is still at a low, introductory price! Q: What is the battery life and charging time? A: This machine is powered by any standard 110 volt power outlet. There is no battery; thus, no charging time. Q: How much does the machine weight? The tires look a little narrow to grass fields- is the machine easily transported in grass? A: The First Pitch Playmaker Soccer Machine weighs about 120 pounds (shipping weight = 125 pounds). 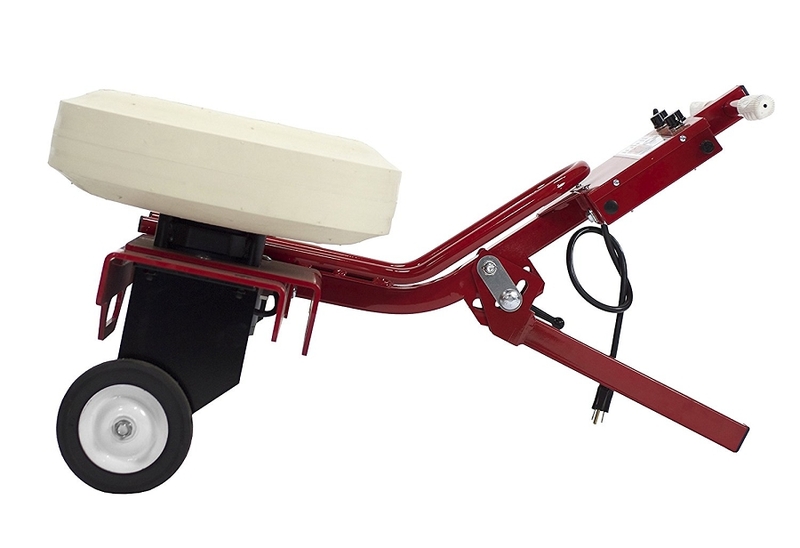 According to the manufacturer, the transport wheels are roughly the same size as a wheelbarrow's wheels. We have not had anyone complain about not being able to roll it through a grass field, so they must be wide enough. Of course, the height of the grass will be a factor in how hard it is to roll. Q: Can this be battery operated or just by electricity? A: This machine runs on 110/120V electricity and has a standard 3-prong electrical plug . That electricity can come from a wall outlet, it can come from a gas generator or it can come a 12 volt battery that you hook up to a battery inverter. Keep in mind, however, that two wheel pitching machines require a lot more power and that they do not perform very well with a battery and inverter unless that inverter is a true sine wave converter (not a modified sine wave converter). True sine wave converters are very expensive, which is why most people who do not have an accessible electrical outlet use gas generators with two wheel machines. To ensure your satisfaction, the First Pitch Playmaker Soccer Ball Machine includes a 14 Day Money Back Satisfaction Guarantee. Returned items must be in good, resellable, "like new" condition with original packaging. Unless returning an item that is defective, customers are responsible for the return shipping costs to First Pitch as well as the original actual shipping costs, whether they obtained "free" shipping or not. There is also a 10% restocking fee on all returned items. First Pitch warrants the operability of your soccer machine for 5 full years for residential use or for 1 full year for commercial use from the date of purchase. This warranty covers all mechanical and electrical parts against premature wear or failure, electrical malfunction, or accidental damage during reasonable normal use. No matter where you order a First Pitch Soccer Ball Machine from, NOBODY actually stocks them; they all ship directly from the manufacturer's warehouse located in Maple Plain, Minnesota. Therefore, the shipping time frame is exactly the same no matter what website you order from (we hope that it is this one!). First Pitch Playmaker Soccer Ball Machines typically take 3-5 business days to ship from the time you place your order. They ship via Federal Express (FedEx) Ground and could take anywhere from a day or two to a week to get to you AFTER being shipped, depending on your proximity to their warehouse. We will notify you of your tracking number the moment we receive it from the manufacturer's warehouse. Click here to download an easy to read, printable PDF of the First Pitch Playmaker Instructions.